While I am waiting on the exhibition planning team to make final decisions about which pieces from the Max Gill collection will be exhibited I thought I would write a little bit about the reasons for mechanical surface cleaning. All of the Gill objects might not necessarily need a lot of work doing to them, but they will all need to be surface cleaned prior to framing. Surface cleaning materials is a very important first step in the chain of events that stabilise an item being conserved. Dirt on objects can be a source of deterioration and in worse cases can contain mould spores that flourish on nutrients found within the paper and any debris left on it. Water has a strong capillary ability and when paper gets wet, the fibres expand. They contract again when drying, and if surface cleaning hasn’t been done, this action traps in any dirt or dust particles left on the paper. Considering the safety of an object needs to be taken into account. The strength of the paper will determine how and if surface cleaning can be carried out. It is important to remember and know that pencil marks, cataloguing marks and random smudges on objects can play a historic part in the object’s life and removing these marks will change the object drastically. I should also note that both recto and verso of the item need to be cleaned. 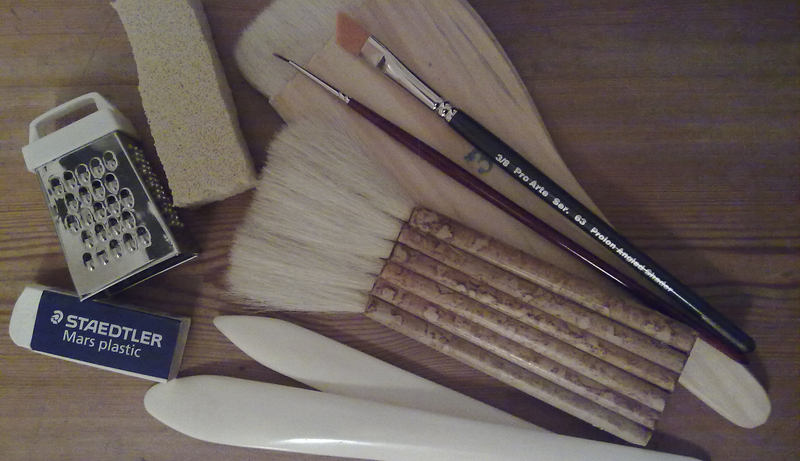 For the most fragile pieces, surface cleaning might take place by using only a brush – the size of the brush will be dependent on how fragile the paper in question is. Mechanical cleaning can also be done with the aid of chemical sponges, which are widely used in conservation. They are composed of rubber and are heavily filled with calcium carbonate and do not leave any residue on the paper’s surface, but are very effective in picking up dirt. An example of how much dirt can be lifted off the surface of a print with a chemical sponge. This is from working on a Macdonald Gill print. Rubbers are also commonly used, and the most widely used, to my understanding, are Staedler Mars rubbers. This particular make is used for the same reason as the chemical sponges – research has shown that this rubber does not leave any residue on the paper’s surface. On sturdier archival pieces, the rubber can be used as a block. For more delicate pieces and items with pencil marks, the rubber is grated and a piece of cotton wool is parcelled inside a piece of anti-static cloth and this is used to gently roll over the grated rubber, removing surface dirt as you go along. Groomstick is another tacky substance that can be used when wanting to pick up larger bits of debris on an item – for example pieces of glass from a broken frame. Groomstick has a very tacky nature and is not recommended to be used directly on the paper as it can damage the fibres. Using a museum vacuum is also an option and is generally used with archives that are very dirty, for example objects that have not previously been stored correctly. Vacuums should have a filter at the tip to enable picking up any loose pieces that may come off in the process. Cleaning tears and around holes and other damaged areas can also propose a problem, as it is important to take care not to damage the object any further. For tears along edges of a piece, a piece of melinex can be used to slide into the tear – this way both sides of the tear can be gently cleaned with less risk of extending the tear. Surface cleaning objects takes a considerable amount of time – especially cleaning larger pieces such as a lot of the proposed exhibition items from the Gill collection. Where can you buy the ‘chemical sponge’? Hi David! 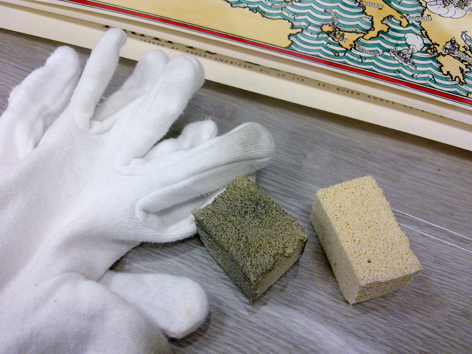 You can buy the ‘chemical’ sponge from the usual conservation equipment places like Preservation Equipment Online and Conservation By Design or from several other online sources – googling ‘chemical sponge’ or ‘dry cleaning sponge’ should bring up a few hits! Hope this helps.